So far my adventures with the Beaglebone Black left something to be desired, so I decided to make my own ARM tool chain and try to get Fedora 20 to run properly on it. The easiest way to prepare code for the BBB is with Qemu. This way, one can make a native ARM system for test and debug on a fast computer and then one can simply copy the resultant programs over to the slow little BBB. Well, that is the idea anyway. which will install the whole catastrophe with all the different processors that Qemu can emulate. This one liner is quite a contrast with trying to make Qemu work on a Mac. So, let's plod through that and see what happens. That guide describes various ways to do it, with and without libvirt, with or without a cross compiler and so on. It is worth scanning through the whole thing once before you start. As is usual with Linux, something is bound to screw up spectacularly somewhere along the line. If one can get this method to work, the advantage is easy access to NAT and DHCP utilities, so connecting to the virtual machine and managing it, is more convenient. That takes a while - So far, so good! Cool, now we are progressing again. That takes a few seconds. 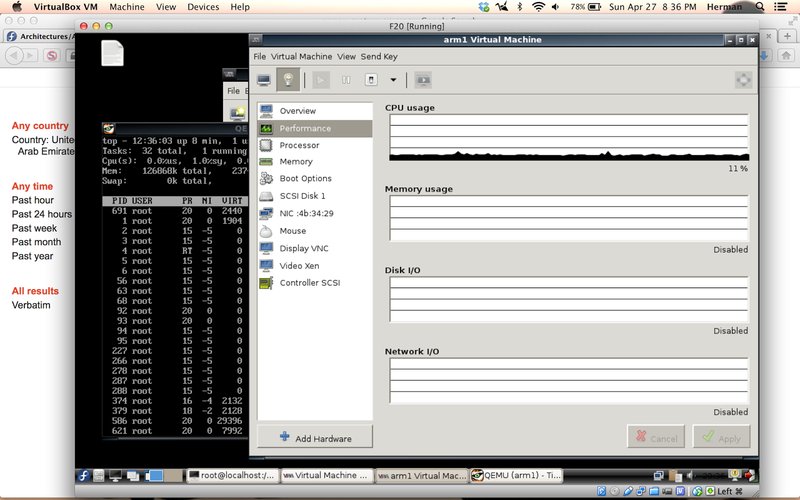 Try System Tools>Virtual Machine Manager on the LXDE menu. It should ask for the root password and then start a simple GUI with one VM called arm1. The command virsh start arm1 gives the same error, while virt-viewer arm1 brings up a dialogue with the message "waiting for guest domain to start", which really doesn't help a lot now does it? Bah humbug #3, that error message is extremely unhelpful. So it is really just the same old problem. After some more experimentation with the Virtual Machine Manager, I found that a combination of NIC=RTL8139, Display=VNC and Video=Xen runs, but that combination is not exactly the BBB hardware. On a second try, I could connect to it with TigerVNC localhost:5900 and log in as root with password fedoraarm. So it can work, I just don't know for how long or why it died before. So now what can I do with it? Hmm, when I try to pause Qemu, VNC exits and the F20 virtual machine becomes unusable. It still runs, but most things don't work and it needs to be reset. Normally, one would use a cross compiler to develop for an embedded system, since compiling something on a dinky little ARM processor will chug along till the sun goes nova and few people have that much time on their hands. In general, two versions are available using either glibc or uclibc. However, I would like to compile natively inside Qemu just for fun. Yes, it will be slow, but a modern umpteen Gigahertz computer should be plenty fast enough - I hope. As with most things, this has been done before, but not necessarily on Qemu.